Mission hills golf club is the largest golf course in Asia, which is equipped with the top golf environment created by the investment of more than 3 billion yuan in luxury clubs, five-star hotels, clubs, golf colleges and golf villas, so that customers can experience the supreme enjoyment when they are on vacation. Guanlan Golf Club needs to equip its five-star restaurant with the most advanced fume purification system. Therefore, the club select Gojek , a leading manufacturer of fume purifiers in Shenzhen. Since the customer of Guanlan Golf Club is celebrities, and the air around the course should be fresh exceptionally, any tiny trace of cooking fume is not acceptable. GOJEK's technical staff came to the field survey, according to the environmental characteristics of mission hills golf club and the size of the restaurant, recommended 108,000 air volume electrostatic lampblack purifier gjesp-1080 + 96,000 air volume UV lampblack deodorant gjuv-960. The fume removal rate of the two sets equipment combination is as high as 98.4%, which is the top level in China. It can reach the effect: no oil, no visible smoke, and without smell . It ensures that all people and the clean and natural environment in the golf course won’t be effect by cooking fume, so that maintain its five-star quality. Shenzhen Gojek team has 8 years of experience in research and development, production and application of fume purification equipment. 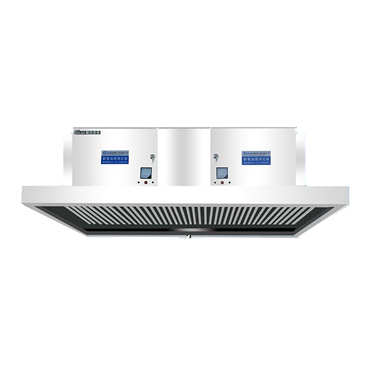 It is a highly recognized brand of fume purifiers in domestic catering industry. The fume removal rate is over 98%, and has the advantages of low energy consumption, safety and long service life.